Celery Root Remoulade, Céleri-Rave Rémoulade, is the French classic that makes a silk purse out of a sow's ear. When I first posted about it more than six years ago, one commenter called it "an adventurous coleslaw," but it's much more sophisticated than that! Could this refreshing winter salad be the "something different" on your menu this month? Celery root, also called celeriac, is a very unattractive fall and winter root vegetable that can be prepared many ways. If you haven't tried it, it's probably because you've been put off by its appearance. It is perhaps the ugliest vegetable you'll ever see, sort of like a hairy turnip with tumors. After all the ugliness is trimmed away, you're left with about three-quarters, even two-thirds, the weight you started with. You can cook celery root, but this raw salad that is a French bistro classic is my favorite. 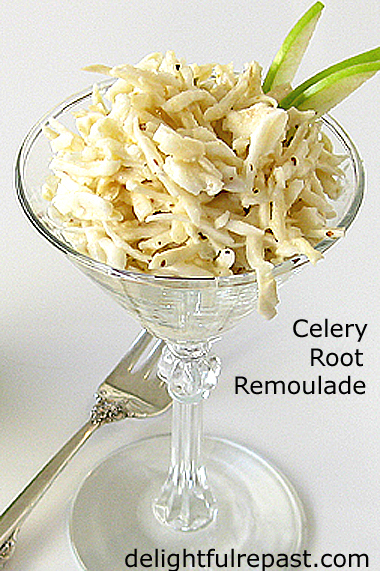 Celery root remoulade is something I first made years ago after seeing Julia Child* make it on television. Of course, I made up my own recipe to suit myself; and here it is. It can be tricky to follow a recipe when celery roots come in such a wide range of sizes. Just adjust the dressing amounts to the weight of the celery root. To make enough to serve two people, look for one that is about 3/4 pound. After all the strange bits are trimmed away, it will probably be down to 1/2 pound, just right for two people. If you've been passing over celery root just because of its appearance, as I did for so long (I feel so shallow! ), quickly pop one or two in a bag next shopping trip. After you taste this, you might even decide that celery roots, like baby hippos, are so ugly they're cute! PS I just learned that ThermoWorks Electronic Gift Certificates are now available and are the easiest and fastest way to give the gift of ThermoWorks (the famous Thermapen and all kinds of thermometers and timers). Note: Though the shreds should be no bigger than a matchstick, they should not be too fine. Coarsely shredded. 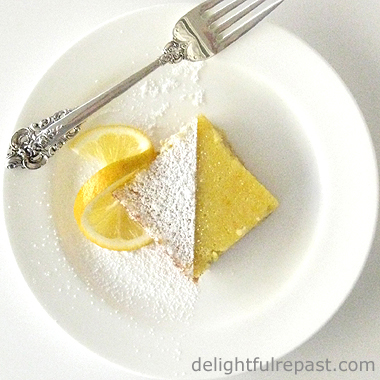 2 In small bowl, stir together 1/2 tablespoon lemon juice and remaining ingredients. Stir the dressing into the celery root and mix well. Taste and adjust the seasoning. Cover and refrigerate for 2 hours or up to 2 days. Note: Though some people say it's not good the next day, I haven't found that to be the case. * See Vegetable Quiche post for one of my Julia Child stories. And, speaking of Julia, she favored white pepper and would not have liked the black specks of pepper in my remoulade! But I love my coarsely ground black pepper and put it in and on everything. 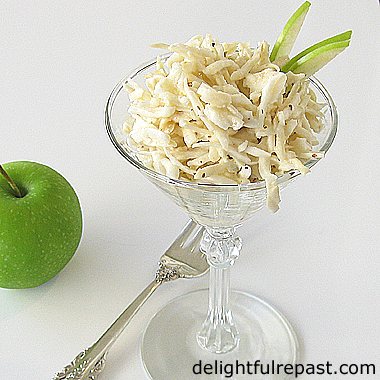 Updated and edited from my archives, Celery Root Remoulade. Disclosure: Some posts contain links to my affiliate accounts at ThermoWorks and Amazon. If you purchase something through one of my links, I receive a small commission, at no cost to you, which I use toward the expenses of running this blog. Thanks for supporting Delightful Repast when you shop! “Adventurous coleslaw,” “a hairy turnip with tumors,” “cute baby hippo” – what’s not to love? This thing is so maverick, I have to like it on sheer principle (you are what you eat). Though, I think I may have tried it somewhere, and the phantom memory I have is of something that tasted like skunk cabbage. Gonna give it another shot…or maybe just shoot it! Nope, Sully, nothing like "skunk cabbage" - trust me, you will like the flavor and texture of this! Give it another shot! I love celery root, but usually in soups and stews. This is another great way to enjoy this winter veggie. Thanks, Jean, for sharing this beautiful recipe. Thank you, Angie. I think you're going to like it raw! After searching the meaning of celeriac root,I discovered I love it!It is an usual salad here with apple and tomatoes.Your recipe looks good and pretty!Merry Christmas,Jean! Thank you so much, Madonna. I'm glad you find my weights and measures helpful. If you make this, do let me know how it turned out for you. Maristella, how interesting! I can't imagine it with tomatoes, but I'll have to try it sometime! I like coleslaw so I'd give this a try. I cracked up at your less than flattering description of the celery root. Now I'm off to see if it's really as ugly as it sounds! Happy Holidays, Jean! Thanks, Margie. And do let me know if you think I was too harsh! Have a wonderful 2018! After eating bucketfuls of this in France over many years, this has become one of my absolutely unavoidable dishes that I tend to force on people whenever possible. It's an unending mystery to me why people avoid this poor, neglected vegetable. If I'm feeling really virtuous or just too heavy, then I sometimes make a version with low fat, strained yoghurt instead of mayo. Have an excellent Christmas. It certainly looks pretty in that glass. I'm with you & JC - black pepper all the way! Phil, thanks. I knew it was neglected here in the US, but same for the UK then? Too bad, because it really is wonderful. I never feel too virtuous or heavy for mayonnaise! Thanks, Mrs Shoes. The glass is nice for a dainty portion, but I eat huge portions of it! When I was a culinary student in France, we used to make dishes out of celeriac frequently, but usually the cooked version, i.e. celeriac puree. However, your raw version looks refreshing- I must go back to Paris and introduce the chefs there with your recipe! Sure, Fran, I'm happy to give you a reason to go back to Paris! :D Like a few other vegetables I can think of, they're good cooked but even better raw. Thank you for the translation to celeriac - I knew it under that name. I'm not sure I've ever eaten it, though. If I have, it was probably as a soup. Pauline, soup is good, but THIS is better! Thanks, Ellen. I hope people will be tempted to try it! I love the taste of celeriac root and use it in different recipes, from soup to salad. Your salad looks wonderful. Merry Christmas to you ! Stopping by to wish you a very Merry Christmas, Jean. Your blog is stunning. Wishing you a happy Christmas. Thank you, Gerlinde! And have a fabulous 2018! Mildred, thank you. And I hope you and John have a wonderful 2018. Thank you, roughterrain. Hope you'll visit again soon. Your celery root remoulade sounds so interesting, Jean. I'm with you on liking flecks of black pepper! Merry Christmas to you!! Thanks, Kitty. It would be a fun thing for you to make with Cissy and Caiden! That looks very nice. I'll try this. I simply love celeriac soup. I admit it's an ugly veg but it has the most divine taste! Thanks, Jenny! Let me know how you like it! Thank you so much, David. True, I don't like things drowning in dressing! Do let me know how it turns out for you. All the best to you and yours. One of my favorite salads but you have certainly presented more elegantly than I've had in the past. :) Hope you had a wonderful Christmas. Thanks, Jaki! It really IS! Happy New Year, Jean! I'm a real fan of celery root, but I've not had the courage to use it myself yet. This recipe will definitely change all that. I can't wait to give your lovely remoulade a try. It looks really fresh and tasty. Sharing, including on the Hearth and Soul Facebook page. Thank you for being a part of the Hearth and Soul Link Party! Hope to see you at the first party of the year tomorrow! April, thank you! I hope you'll try this soon, and DO let me know how it turned out for you. See you tomorrow at the H&S link party! Judee, thank you so much. I'm really glad that ugly thing will not go bad next time around! :D I think you'll like this a lot. Do let me know when you make it!